Blog titles below link to bloggers’ post for the Jane Austen vs Charles Dickens Circuit. I hope you enjoy looking over all the posts, and a big thanks to all who participated! This was a very close call and I ‘m not sure how close we are to declaring a winner. We have to put it up for a vote! So please take the time to think about your experiences with these authors and watch out for our tie breaking poll at the end of the week. And of course stay tuned for the next Classics Circuit tour. 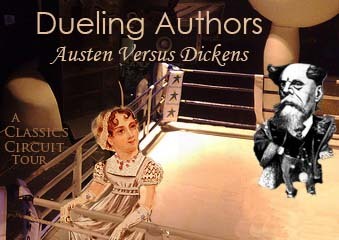 Sign up is now open for the Dueling Authors Tour: Austen Versus Dickens. Come find a novel to read and sign up!